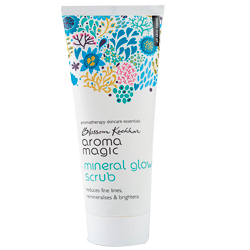 Aroma Magic Mineral Glow Scrub Reduces Fine Lines, Remineralises & Brightens Skin. Reduces fine lines, remineralises and brightens. 100% free of harsh chemicals, alcohol, parabens, phthalates, sulphates, artificial colouring & fragrance. Triple action scrub formula made of natural exfoliators of cornflower and grain almond meal gently buffs away dry skin and dead cells resulting in fresh, young, energised and healthy skin. Rice bran oil and aqua minerals remineralise and enrich your skin reducing fine lines effectively. Aromatherapy blend of tea tree, rose and lavender essential oils helps to balance the level of oil in your skin and protects it from daily pollution and dirt. The goodness of moisturising agents like beeswax and glycerin keeps your skin smooth, radiant and nourished. Aqua, Cers Alba, Aqua Minerals, Centaurea Cyanus Extract, Oryza Sativa Bran oil,Pranus Amygdalus Dulcis Meal, Vegetable Glycerin, Lavandula Angustifolia Essential Oil, Melaleuca Alternifolia Essential oil, Rosa Cent folia Essential Oil, Food Grade Color.